Have you ever experienced a charley horse? It’s that sharp, sudden pain of a muscle tightening, often when you are about to drift off to sleep. Muscle spasms or cramps can happen to anyone at any time and occasionally last for a few minutes. For longer lasting muscle pain, there may be an effective alternative to medication. Natural muscle relaxers do exist. We will examine various pain relievers, including natural muscle relaxers for back pain, one of the more common health concerns. Muscle relaxers are typically used to relieve pain or tenderness in the back, legs, and head, or for symptoms associated with various disorders. Those with fibromyalgia, lupus, rheumatoid arthritis, hypothyroidism, and chronic fatigue syndrome in particular experience mild to excruciating pain. Our central nervous system is primarily responsible for the tightening and hardening of the muscles. This can be caused by the injury or straining of a muscle, overuse of joints, and nerve compression. Muscle relaxers have been used for centuries, beginning with the use of poison-tipped arrows to paralyze the affected muscle. Many of today’s muscle relaxers were used in anesthesia and surgery in the 1940s. Find out how to relax muscles with the following list of natural muscle relaxers. Their ingredients may help reduce inflammation, relieve muscle tension or tightness, and eliminate stress on the central nervous system. Just remember it’s important to talk to a health care provider with knowledge of your medical history and current medications to make sure there aren’t any allergies or potentially dangerous drug interactions first. Known for its analgesic, antispasmodic, and anti-inflammatory properties, peppermint may be effective for relieving the symptoms of muscle spasms. The menthol component may relieve pain and inflammation, and help to maintain good blood circulation, the cause of many cases of muscle tension. Use peppermint for tension headaches, an aching back, sore muscle, and leg pain. Enjoy peppermint tea with one teaspoon of fresh or dried peppermint leaves steeped in hot water. You can also use a topical application of peppermint essential oil, ensuring to mix with a carrier oil. Never use peppermint oil alone or take orally. Use two drops of peppermint essential oil and sandalwood oil mixed with one tablespoon of sweet almond carrier oil directly on the affected area. That little spice you enjoy using on favorite food dishes can also be used to reduce inflammation, pain, and stiffness of muscles and joints. 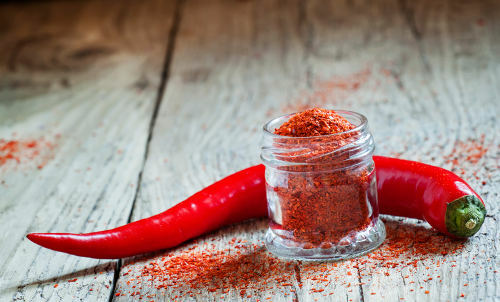 Cayenne pepper has capsaicin, which is comprised of anti-inflammatory and analgesic properties to fight these issues. It can inhibit the brain’s transmitter to recognize pain while the muscle heals. The British Journal of Anesthesia published a 2011 study suggesting topical use of capsaicin is a valuable tool in pain management. To relieve pain, apply a mixture of one teaspoon of cayenne pepper and two tablespoons of heated extra-virgin olive oil directly on the affected area for 30 minutes. Avoid application to skin with sores or irritation. 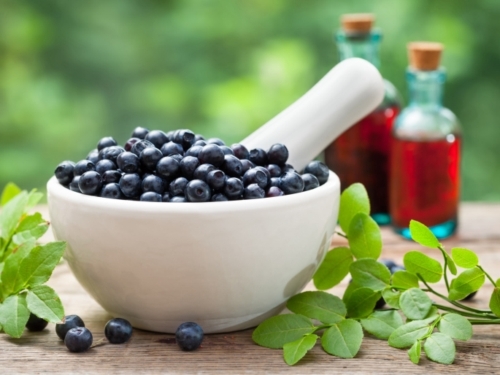 Blueberries are well known for their antioxidant and anti-inflammatory properties. They contain a powerful group of flavonoids known as anthocyanins, which may prevent cell damage due to oxidation or inflammation. A study published in the May 2012 issue of the Journal of the International Society of Sports Nutrition suggested that drinking a blueberry smoothie before and after intense exercise can speed up muscle damage recovery. One of the best uses for Epsom salt is to relieve tired, cramped muscles, particularly the legs and feet. This is a shopping lover’s biggest secret! Our muscles need magnesium to work properly and levels found in Epsom salt may ease cramps and tension. Epsom salt may indirectly relieve pain and inflammation by eliminating the toxins that cause the discomfort. Have a warm bath with two cups of Epsom salt for 15 to 20 minutes at least once a week. Your skin will easily absorb the salts. This herb has been used since ancient times to eliminate inflammation and the pain that accompanies it. With 36 documented flavonoids, chamomile is believed to help the body remain in a resting state to promote faster healing. For pain relief of muscle tightness and spasms, use a mixture of chamomile essential oil with a carrier oil directly on the area. Tea drinkers can try combining hot water with one tablespoon of chamomile flowers. Ready-made chamomile tea bags are also available. Low amounts of magnesium in the blood may result in muscle cramps and spasms. Magnesium is essential to the proper functioning of muscles and nerves in the body. Adding foods rich in magnesium to your diet may reduce your risk of painful muscle contractions. Nuts and seeds, dark chocolate, and mackerel fish are all great sources of the mineral. This traditional herb is widely used to treat muscle pain in the legs, back, head, and joints. Lavender has anti-inflammatory components that could potentially attack inflammation that causes pain and swelling. Mix a few drops of lavender essential oil with a carrier oil such as olive or coconut oil. Massage directly on the area of concern before relaxing in a warm bath with a few drops of the essential oil. The calming aroma of lavender promotes sleep, which may aid in the progression of healing. These little fruits have antioxidant and anti-inflammatory properties that may fight muscle pain. The Journal of the International Society of Sports Nutrition published a 2010 study promoting the use of tart cherry juice for seven days leading up to a major running event to reduce muscle pain. A daily intake of one cup of the cherries could potentially prevent muscle pain onset. You may also attack inflammation and muscle aches by drinking a cup of tart cherry juice. Once used as an ingredient in sixteenth-century perfumes, valerian root may relax muscle and tension pain. It may also induce sleep and reduce stress. Try relaxing your muscles naturally with this plant product. Valerian can be consumed in a tea by using one teaspoon of the dried root. The results can also be produced with ½ teaspoon of valerian liquid extract taken orally. Pregnant and breastfeeding mothers should avoid using this herb. Composed of anti-inflammatory and analgesic properties, arnica targets damage, inflammation, and pain surrounding the affected muscle. It has thymol to increase blood circulation to promote a faster healing period. It can be used as an oil or topical application. The arnica essential oil can be used with a carrier oil and applied directly onto the tender or painful area. Do not use on irritated skin or sores. In addition to using any, or all, of these natural muscle relaxer remedies, the healing process calls for good sleeping habits, plenty of rest, keeping hydrated, and using the affected muscles very little. Are There Any Side Effects of Muscle Relaxers? Prescribed synthetic muscle relaxers and those purchased over-the-counter can have damaging side effects. As central nervous system-targeting drugs, muscle relaxers can be highly addictive. Your body may become dependent on them to carry out daily activities, although muscle relaxers should only be used on a short-term basis. Spasmolytic muscle relaxers are used to relieve pain while the other type, neuromuscular blockers, are used in emergency situations such as surgery. These blockers temporarily paralyze the muscle. None of these medications are recommended for those with a history of alcohol or drug abuse or depression. Women who are pregnant or nursing should also avoid the use of muscle relaxers. The need for pain relief is a common human response to injury, strain, or other ill-affecting disorder. Muscle relaxers have been used for centuries to reduce inflammation, alleviate pain, and promote a quick recovery. The components of synthetic drugs can have dramatic side effects on our body such as addiction, while the natural properties of many herbs, minerals, and spices may offer the same healing results without as many negative side effects. It is vital to take care of yourself during your recovery time by getting rest, fluids, and avoiding excessive use of the damaged muscle. “10 Best Natural Muscle Relaxers,” Top 10 Home Remedies; http://www.top10homeremedies.com/kitchen-ingredients/10-best-natural-muscle-relaxers.html, last accessed February 24, 2017. “Muscle Relaxants,” Web MD; http://www.webmd.com/back-pain/muscle-relaxants-for-low-back-pain, last accessed February 24, 2017. Fanous, S., “The 7 Best Natural Muscle Relaxers,” March 27, 2015; http://www.healthline.com/health/pain-relief/best-natural-muscle-relaxers#1, last accessed February 24, 2017.